My favorite strawberry shortcakes are found at Gibsons Bar & Steakhouse in downtown Chicago. They are absolutely enormous and are filled with heaps of beautifully ripened and sweetened strawberries and cream. From Get Your Bake On. I’ve used their version as the inspiration to create this wonderful dessert, which is especially amazing in the warmer months when strawberries are at their peak. 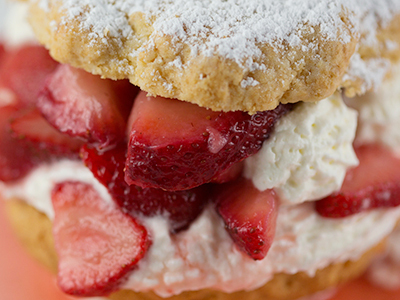 These shortcakes are perfect to make if you’re looking for something fast, easy, and delicious. In a small bowl, whisk together the egg yolk, half-and-half, and vanilla; set aside. In the bowl of a food processor, combine the flour, 3 tablespoons of the granulated sugar, the baking powder, baking soda, and salt and pulse to combine. Add the butter and pulse until the mixture resembles coarse crumbs. Add the egg and half-and-half mixture and pulse until a moist dough forms. Spoon the dough in 3-inch mounds on the prepared baking sheet, spacing them at least 1 inch apart. Brush the tops with the heavy cream and sprinkle with the turbinado sugar. Alternatively, roll the dough into a 3/4-inch-thick round and use a 3-inch biscuit cutter to cut out shortcakes. Place on prepared baking sheet about 1 inch apart. Gather the scraps, reroll the dough, and cut as many rounds as you can. Bake the shortcakes until golden and a toothpick or cake tester inserted into the center comes out clean, about 12 minutes. Transfer to wire racks to cool while you prepare the strawberries. In a medium bowl, combine the strawberries with the remaining 1/3 cup granulated sugar and stir to coat. Refrigerate for about 25 minutes to macerate and bring all the juices out. To assemble, slice the cooled shortcakes in half and set the bottom halves on a plate. Spoon a dollop of Chantilly cream on the bottom and then top with macerated strawberries. Finish by setting the shortcake top over the strawberries. 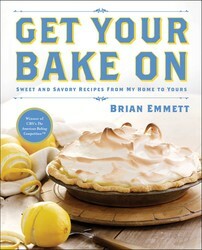 Brian Emmett, the ultimate “foodie” and home entertainer, has been baking, cooking, serving, and designing the most unique culinary experiences for over twenty years. He was the 2013 season one winner of The American Baking Competition on CBS. He currently resides in Itasca, Illinois, with his wife and daughters, where he’s a principal at Our Marketing Works, LLC.